Who in a nonprofit organization is responsible for fund-raising? Should the CEO follow or lead the board? The CEO’s next responsibility is to work closely with board directors who have development backgrounds, skills, contacts and the interest to expand the efforts to attract resources from a wider range of organizations and individuals. This is usually a small group. Although some directors may be affluent and may make substantial contributions to the organization themselves, they may hesitate to become involved in the organization’s development effort. 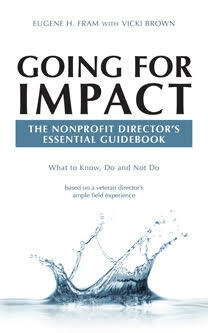 When pressed to become involved with development, some directors may completely disengage from the nonprofit. The ones I observed in this category have had moderate commitments to the mission. But they feel work-family obligations need to have priority. A nonprofit group identified a community need that fell within its mission and designed a program that would assist the specific population in need. The program was taken before the board, which agreed to move ahead with it, after substantial discussion. Several board directors were requested to assist the CEO in opening doors or in making calls. Some board members volunteered to make their own calls, but in other situations, the CEO and a director made joint calls. The board chair and CEO needed to clearly identify directors who have the interest and drive to become involved in development. The ones that lacked these qualities can resign their board positions if they are pushed too far in the development direction. However, all directors need to be in a comfort zone to bring potential leads to the CEO’s attention. When it comes to raising funds, consider the CEO the forward scout looking for potential sources of funds. The board – the cavalry – is called to support that effort and broaden the base of support. In other words, the scout gives the signal, but the cavalry is needed to take the objective. The process is rarely as this structured, but the analogy clarifies development roles. ← A Nonprofit Board’s Most Important Job! Everyone in the organization is responsible for fund raising. As the leader/CEO, if you “wait” for anyone, you will get no where. You can not wait for the board especially when they are resistant and fearful. Yes a CEO just can’t be a laggard in the situtaion you describe. Yes. A CEO can’t be a laggard in this situation. Agree. Not only training but constant reinforcement. The CEO sets the tone for board and staff, That leadership is necessary to demonstrate the need for everyone to be fundraising every day. Staff and board members need training to get over the fear of “asking” and be willing to share the organization’s story to potential donors. I agree the CEO needs to get out of the weeks. He/she also needs know how to interact with senior business executives on a peer basis, not in a parent-child relationship. You may be interested in these articles and links, if you already haven’t seen them. focusing the board on policy & strategy and having a robust board evaluation focused on outcomes and impacts, not processes. It has been adopted or adopted by thousands of nonprofit boards. There is a real danger if any one staff person becomes identified as the primary fund raiser in the organization. With the exception of development officer or fund raiser, every staff person including the CEO has significant other responsibilities. These other responsibilities usually (read: should) bear directly upon the organization’s mission. The peer approach principle is key in understanding each person’s responsibility for fund raising. Whenever any person’s time is being devoted to soliciting gifts from individuals one-on-one, the question must be asked whether this is the right person to do the asking. The person who actually asks should be the person who has the most likelihood of getting a ‘yes’ (unless of course there is a conflict of interest, that is, employees should not be asked by their supervisors). In some cases, yes, the CEO should do the asking. But all other things being equal, the person doing the asking for a larger gift should be someone who is actually making a larger gift themselves. It should also be someone who is known and respected by the prospective giver. All persons in a fund raising campaign should be taught Rule Number One: that charitable intent is the underlying basis of all ethics in fund raising. There should be no ‘cold calls’ — every asker should be working with prospects that have been pre-qualified as having charitable intent toward the organization or its mission. And also bear in mind that though fund raising campaigns tend to be more successful toward the end of a tax year, tax benefits should not be cited as an advantage of giving because that disregards Rule Number One. Another fact that should be part of any asker’s training is that charitable support follows the mission; follows the work being done. Your most effective askers will be the people who can speak most eloquently about your organization’s mission and its importance. If the donor can see or visualize the work that’s being accomplished, they are far more likely to give. The CEO may or may not be the most effective communicator of the organization’s work and mission, but they should definitely be more than just competent at it. So who in a nonprofit organization is responsible for fund-raising? Everyone. But the peer approach principle should apply; it will not always be the CEO or the Board Chair. The Board should have a development committee, but paradoxically that committee’s role should include seeing that fund raising activities and responsibilities are fairly well spread around. Consider having a separate committee for your annual appeal or any other campaign involving major gifts. Should the CEO follow or lead the board? By definition, the CEO is subservient to the Board in all matters. Though there may be cases where a CEO is the best asker for certain gifts from certain prospective givers, if you are expecting your CEO to ‘set the pace’ or ‘take the lead’ in fund raising, you are pretty much putting all your eggs in one basket, and you will not get a good yield in fund raising across-the-board. Identify your larger gift prospects, and rate them each individually in terms of who might be best at soliciting the gift from each of them. Major gift campaigns should involve a plurality or majority of Board members, but other volunteers should be recruited as well for this very specialized function. Lastly, your fund raiser or development officer should never, ever be seen as the sole person responsible for raising money. A good organization with a valid mission will involve many people in fund raising, from staff, to board to volunteers. But especially volunteers. Your fund raiser or development officer should help formulate the plan and track it all to see that it gets done — and of course provide management and logistical support. One last thing: never, ever hire a fund raiser on a commission basis — in professional terms, that is considered broadly unethical because it confuses the case for the support of the organization with the case for the support of the individual. John: Thanks for your very substantial additions to the discussion.